DCFDA - Cellular ROS Assay Kit / Reactive Oxygen Species Assay Kit (ab113851) uses the cell permeant reagent 2’,7’ –dichlorofluorescin diacetate (DCFDA, also known as H2DCFDA), a fluorogenic dye that measures hydroxyl, peroxyl and other reactive oxygen species (ROS) activity within the cell. After diffusion in to the cell, DCFDA / H2DCFDA is deacetylated by cellular esterases to a non-fluorescent compound, which is later oxidized by ROS into 2’, 7’ –dichlorofluorescein (DCF). DCF is a highly fluorescent compound which can be detected by fluorescence spectroscopy with excitation / emission at 495 nm / 529 nm. Previously called DCFDA / H2DCFDA - Cellular Reactive Oxygen Species Detection Assay Kit. This kit contains sufficient materials for approximately 300 measurements in microplate format and 70 measurements (35 mL) by flow cytometry. This kit is not compatible with fixed samples. Stained cells must be measured live. Kobashigawa et al. (Pubmed 25127116) used the DCFDA ROS assay ab113851 to investigate the causes of the protective effects of metformin (Met) treatment in Doxorubicin (Dox) induced cardiotoxicity. They identified that in metformin treated H9c2 rat immortalized cardiomyoblasts, Met treatment reduced ROS levels induced by Dox (A). Values represent mean ± S.D. (n = 4). In combination with other assays, they developed the hypothesis that Dox induces increased ROS expression, leading to increased calcium levels and cell death, and that Met reduces this effect by increasing AMPK expression. ab113851 (DCFDA) labeled and unlabeled Jurkat cells were treated with 50 µM tert-butyl Hydrogen Peroxide (tbHP), then analyzed by flow cytometry. Jurkat cells were labeled with DCFDA (20 µM) or unlabeled (none) and then cultured an additional 3 hours with or without 50 µM tert-butyl hydrogen peroxide (TBHP) according to the protocol. Cells were then analyzed on a fluorescent plate reader. Mean +/- standard deviation is plotted for 4 replicates from each condition. TBHP mimics ROS activity to oxidize DCFDA to fluorescent DCF. Acute Effect of anthracyclines on ROS production in HL60 cells. 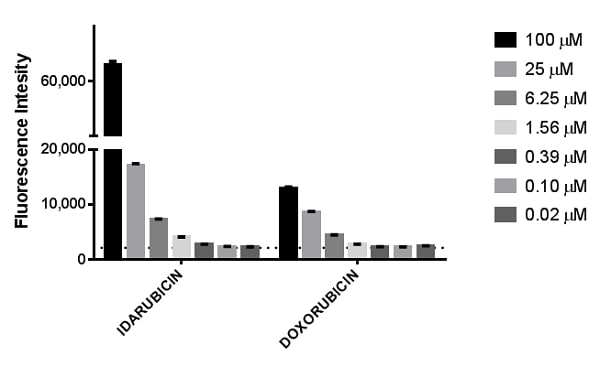 Labeled HL60 cells were treated with idarubicin or doxorubicin for 4 hours at multiple doses according to the protocol. At the end of the treatment cells were read end point in a fluorescent plate reader (Perking Elmer-Wallac 1420 Victor 2 Multilabel plate reader). Mean +/- standard deviation is plotted for 3 replicates from each condition. The dotted line represents the mean of 24 replicates of HL60 cells treated with 0.5% DMSO. I see media with phenol red has a higher background in this assay. What is the typical background OD seen with phenol red media? In the protocol we recommend to run the assay in the absence of phenol red as it can increase the background. The background seems to be more of a problem on spectrophotometers than on flow cytometers. Because it is well known that phenol red gives reading at 530nm we do not have development data using this kit in the presence of phenol red. ab113851 provides 55mM TBHP. 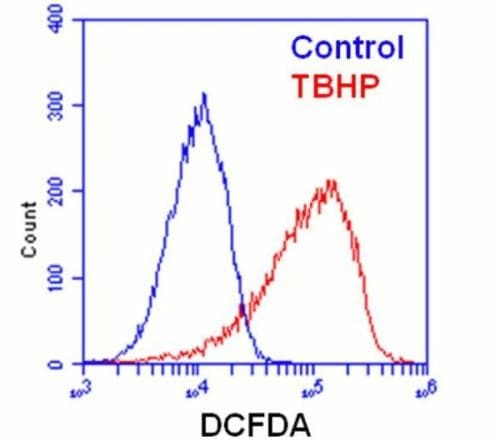 What concentration of TBHP do you suggest to use as positive control on A375 cell line (an adherent cell line)? In your suggested assay templates figure 3 in your protocol booklet, it mentioned vehicle titration control or vehicle control. What is vehicle titration control or vehicle control? I would suggest starting with 50 µM of TBHP as a positive control as we have observed linearity of signal when seeding Jurkat cells at 200,000 cells per well with treatments of TBHP from 50 – 500uM. The amount of TBHP to use will however depend on the sensitivity of the cell line to TBHP (HL60 and Jurkat cells are very sensitive whereas HepG2 are very insensitive). Therefore you may have to optimise this concentration depending on your cells sensitivity to TBHP. What is the vehicle that is used as a negative control treatment for cells instead of treating with tbHP? In this case ter-Buytyl hydroperoxide solution is made up in 5M decane. 5mM decane could be used to treat the control culture, as the TBPH is given at 1000X concentration. Is measurement at 570 nm possible? A measurement at 570nm will not detect the dye (DCFDA). The dye has the emission maximum at 529nm. We give 535nm, as the old plate reader with UV lamp can measure this wavelength and this works with the kit. I therefore propose that you buy the kit only, if you find a plate reader capable of reading at 535 or 529nm. My sample is moving cells - spermatozoa. So it is not easy to take a good picture without fixing the sample. Are the three dyes compatible with fixation of the cells (i.e, 4% PFA or other)? Would the microscopic observation work with fixed cells to reflect the changes of ROS (or RNS) levels? I want to try this kit for confocal microscopy, do you think it will work with cells fixed with formaldehyde? The lab has informed me that the cells must be alive, so fixed cells will not work with this kit. Why is the staining of cells before treatment? And why does it indicate not to wash the cells after treatment for the Flow Cytometry protocol, when it allows for washing with the microplate protocol? Won't the media from my cell treatment affect my flow cytometry reading? In our experience, running the flow cytometer with cells in media did not appreciably affect the data – there was marginally less “background” if the cells were washed, but the slight improvement in data signal did not warrant the extra steps. Hence we recommend the simpler procedure of reading directly in media. Staining of the cells before treatment allows (1) bulk labeling of the cells with DCFDA (2) the compounds/treatments to remain on the cells at the time of the reading. For example (with drug treatments), if treatments were done first, then subsequent addition of DCFDA would lead to a dilution of the treatments (unless drugs were also spiked into the DCFDA solution). Again, this is a case of protocol simplification. Also note that for some drug treatments the effect on ROS levels can be rapidly reversed e.g. a drug can induce ROS levels in a cell, but cellular ROS levels can decrease rapidly as soon as the drug is removed/diluted. 1) After the wash, should more buffer be added to the wells before reading or are they supposed to be read empty? If buffer should be added, how much? 2) For treated adherent cells (page 8 step 6), can the compounds be diluted in media with phenol red? 3) If I do dilute the compounds in media instead of 1x buffer, do I need to wash the wells and add 1x buffer prior to reading, for consistency with the untreated controls? 1) The plate should be read with buffer (100uL/well). Cells must be alive during the reading. 2) For a plate reader assay, it is preferable not to use phenol red as there could be background. If you need to read to phenol red, make sure to include appropriate negative controls = (1) unstained treated cells with media, (2) media only with no cells." 3) It is essential to read in the presence of compounds. If you need to read in media ensure that untreated controls are also read in media and as in answer #2 make sure you include appropriate negative controls to take into account any background signal. When I washed the cells with PBS, I didn't see that any cells were washed away. However, after I stained with DCFDA, the cells were washed off the 96 well plate with 1*buffer solution. Have other customers experienced this? Do you have any suggestions to fix the issue? 1. Make sure to was the cells very gently. Use a multi-channel pipettor to gently add was buffer by letting it slowly stream down the side of each well. 2. Alternatively, you can coat the plates to increase cell adhernce. Poly-L-lysine is often used to coat wells for this purpose. Alternative treatments for coating the plastic wells may exist which are better for your application however. In the product instruction, it says I should seed the cells in sterile, tissue culture treated, BLACK 96-well microplates, can I use sterile, tissue culture treated, White 96-well microplates instead? What is the difference between them? For adherent cells, at the last step before reading, it says "Wash the plate once with 1X buffer solution" and nothing else. Does it mean when read in the plate reader, there is no liquid in the well? Will it affect the result? Or I just need to keep the buffer solution in the well? The primary difference between white and black plates is their reflective properties. White plates reflect light and will maximize light output signal, black plates absorb light and reduce background and crosstalk. For this reason, white plates are commonly used for luminescent assays and black plates are used for fluorescent assays. For this reason we recommend black plates with this kit. Thus white plates may result in higher crosstalk and higher background with this kit. Regarding second question, if toxicity assay is not of interest, just add 100 uL/well of 1Xsupplemented buffer solution after the washing step.